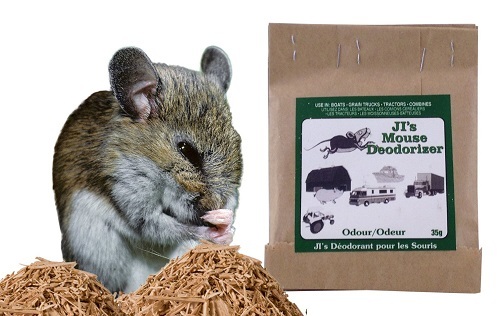 "This product is designed to keep mice out of vehicles, and it just happens to smell awesome too! The big benefit is that you don't have to clean dead mice from traps AND there is zero poison in this stuff, so cats, dogs and kids can be around it without worry. I mean, really, you could wash your hands with it since it's 50% soap..."
I was sent (4) pouches of mouse deodorizer to review. The price for this set is $24.99 (you can choose other sets, too). Shipping is free with Amazon Prime. These pouches of JI's Mouse Deodorizer arrived to me in good condition. There were no defects during shipment, and everything was intact. There were a few pellets out of the pack, but not enough where i thought there was a major leak in one of the bags. They were all stapled together and shipped inside of a resealable plastic bag. That way you can keep the ones that you are storing in here for later use. It wasn't too much, but some of the smaller pellets leaked out of one of the bags. I found the bag after I took them out. All four bags were stapled together at the top. Just tear them off to separate them. Only the front bag and the back bag had labels on them; the middle two were plain. The front labels the brand, product, sizing information, and a few examples of where you can use this. The back provides the instructions in both English and French. You can find the company contact information here as well. Well, no matter how hard I try to keep the mice away, they always find a way to sneak in. I have a cat, live traps, the bug man even put stuff under our house to deter them from coming in. Every now and then, I'll hear something in the cabinet nearest the floor and my cat starts going crazy. I know it's a mouse. I open the cabinet-- no mouse, but he sure makes himself known...he chewed up a plastic bag of dog treats, and left a little after-digestion present for me. When I see this, I poke a few holes in the back of one of these pouches and set it in the cabinet. I'm not sure how it works, but it does. It smells great, too. I really like the fact that it's non-toxic considering I have pets and kids running around here. I've already lost one dog from D-CON poisoning, and I refuse to go through that again. It smells like Irish Spring. This is made from 50% soap, and 50% magic. Very clean smelling-- fortunately, the mice hate this about it! You can use these anywhere you want. Safe to use, and non-lethal deterrent. Works (this is definitely a pro!). I haven't found any cons of this deodorizer. I absolutely LOVE anything that has to do with fragrance (good fragrance that is!). I have been collecting candles, air fresheners, and the like for years now. I have this huge cabinet in my living room to store all of my things like that in, and I have them separated by what I can use versus my collector’s editions that will never be used. Now, I came across this, and it is marketed as BOTH a pest control product AND an air freshener. Strange. But awesome. I have never seen anything like this, so I just had to try it. When I got it, the four packs come stapled together, so as you need them—tear off what you need. Overall, I am SUPER happy with these, and I regret not getting the 12-pack from the get go. These last so long, and they are so versatile (cars, trucks, houses, outside buildings, etc.). There is nothing that I dislike. You get what you pay for—these are worth every single penny. Are you wanting to try JI's Mouse Deodorizer, too? Click the link below, and order away!